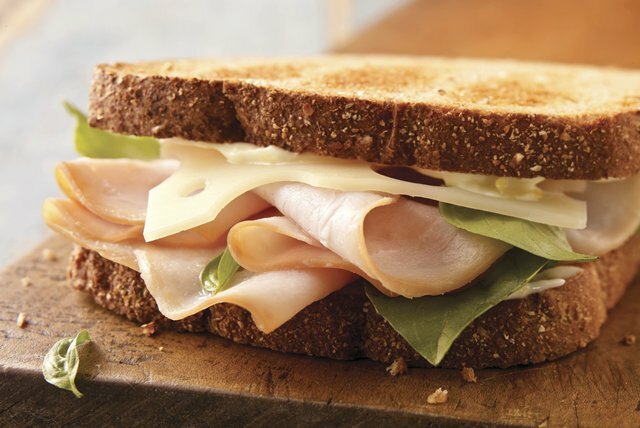 You'll feel like you're basking in the California sun—wherever you live!—when you bite into this lemon-zesty turkey and Swiss sandwich. Mix mayo and zest until blended; spread onto toast slices. Fill with remaining ingredients to make 2 sandwiches. Small ingredient substitutions, such as KRAFT Mayo with Olive Oil Reduced Fat Mayonnaise and KRAFT Slim Cut Swiss Cheese Slices, result in a savings of 120 calories and 10g of fat, including 3.5g of sat fat, per serving when compared to a traditional recipe. Next time you remove the zest from a lemon, be sure to remove all of the zest, even if you only need a little. Place any extra zest in a freezer-weight resealable plastic bag, seal, and store in the freezer for up to 2 months. Prepare using OSCAR MAYER Natural Applewood Smoked Turkey Breast or Slow Roasted Chicken Breast.